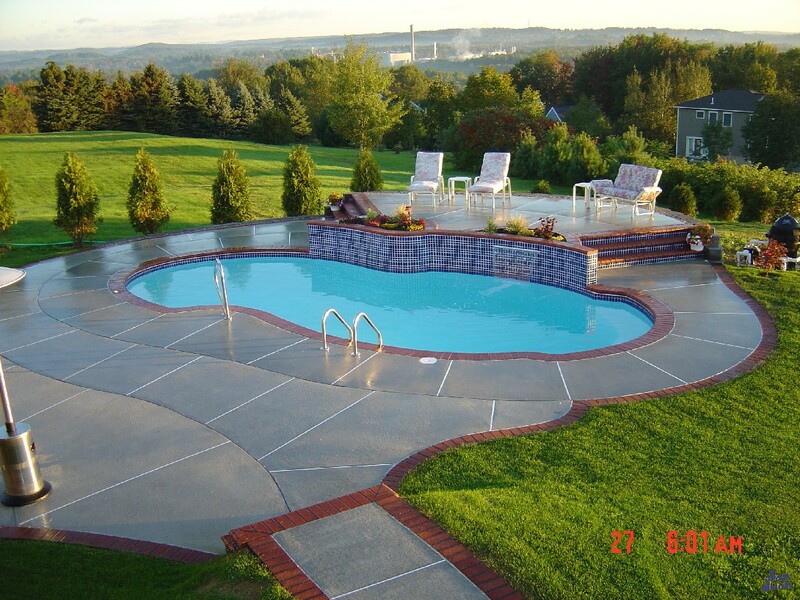 The Atlantic is one of our classic fiberglass pool designs! It’s length of 33′ 1″ and total volume of 10,400 puts this pool into our Medium Pool Size category. 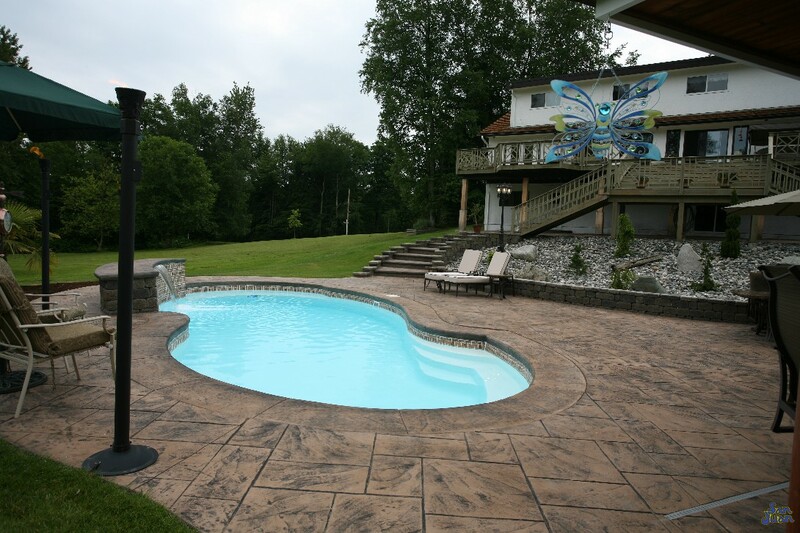 The Atlantic Fiberglass pool is one of our most fiberglass swimming pools. Based on a conservative free form layout, this swimming pool offers a traditional shallow-to-deep end design. Perfect for both lap swimming and recreational play, this swimming pool will bring your family outdoors for hours of fun! The Atlantic’s shallow end entry steps provide a smooth entrance into the pool. We recommend adding a handrail for increased safety and allure. Light it up at night with basic incandescent lighting or spruce it up with state-of-the-art LED for a glowing light show. The Atlantic offers a basic shallow-to-deep end design which is familiar to most swimmers and provides plenty of swimming space. It’s moderate deep end of 5′ 9″ is perfect for swimmers with moderate swimming abilities. Lastly, it’s also an exceptional pool to enjoy your new outdoor floating raft! 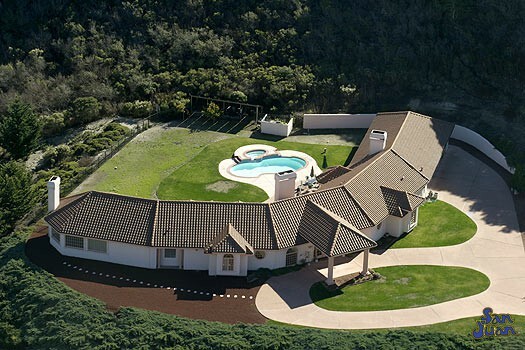 Another interesting feature of the Atlantic fiberglass swimming pool is its uncanny resemblance of a Figure-8. Although it’s still classified as a “free form” shape, we’ve also sub-categorized it as a Figure-8 layout (click the link to see other similar designs). Secondly, the Atlantic holds a large amount of water up to 10,400 gallons. It requires a moderate amount of backyard space with a total surface area of 375 SQFT. For other similarly sized swimming pools, check out our Medium Sized link here. 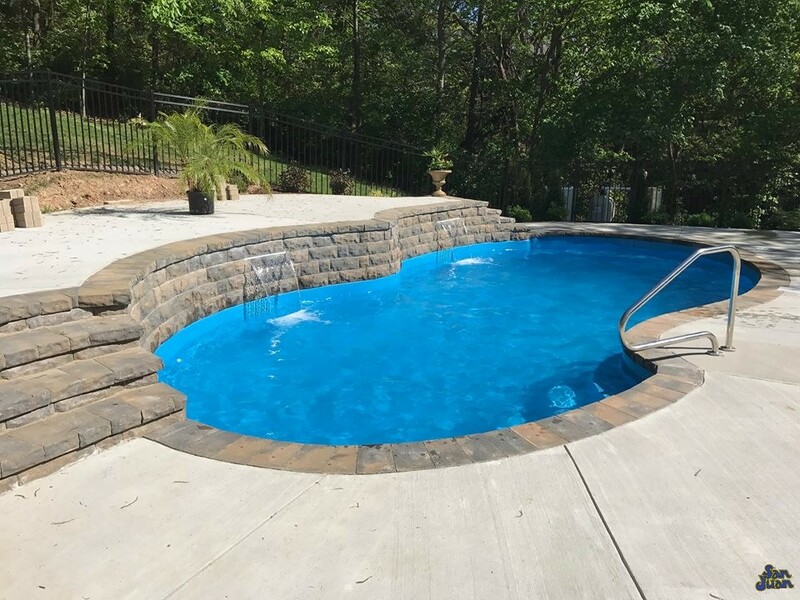 Since its original launch with San Juan Pools, we’ve sold thousands of Atlantic pool shells to excited families eager to jump into this classic beauty! It’s a surreal time when you see your brand new fiberglass pool shell arriving on the back of a semi-truck at your home and the crane preparing to take it off. It’s also the moment when you realize that your backyard just transformed into the funnest place to hang in the entire neighborhood! 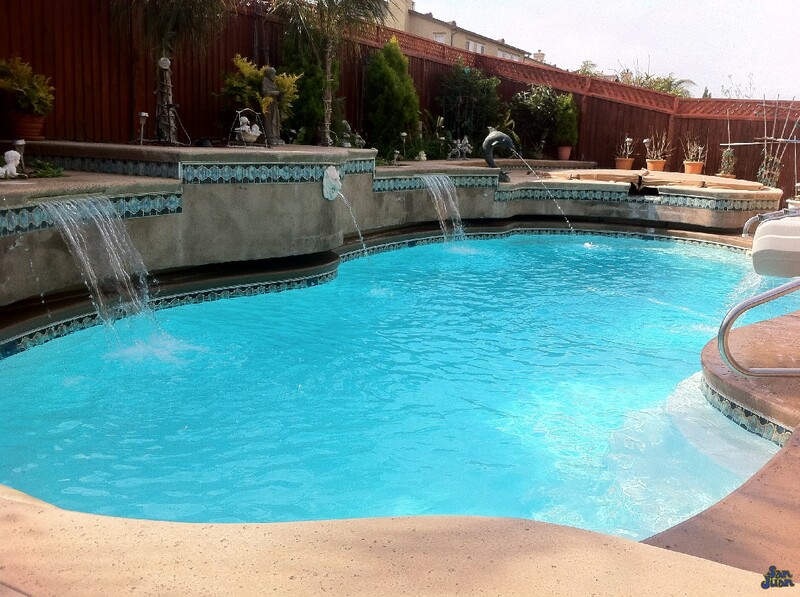 All of our swimming pools are designed to enhance the quality of your outdoor lifestyle. The Atlantic is intended for a conservative backyard design that is both simplistic and functional. It’s meant for the family that wants to entertain, allowing plenty of room for the kids and wants a nice layout with an interesting shape. We recommend the Atlantic fiberglass swimming pool for it’s creative layout and compact design. It’s width of 15′ 7″ and overall length of 33′ 1″ is a perfect fit for most medium to large backyards. It’s surely a pool that will entertain your guest and provide a beautiful backdrop for many landscape designs.